With over 25 years of experience in the Patio Cover / Carport industry our installers take pride in their work. Protect Your Vehicles with a heavy duty Carport. Get the protection you need without the expense of building an additional garage. Get quality workmanship for your home carport or patio cover anywhere in central Oklahoma. All Carports and Patio Covers come with a two year workmanship warranty. Schedule an expert carport installation in Oklahoma City,Yukon,El Reno, Midwest City, Del City, Moore, Norman, Choctaw, Guthrie, Newcastle, Harrah, and all surrounding areas. Your car deserves a Ballew's aluminum carport. Shelter your car or boat from rain, hail, snow, and blistering heat. 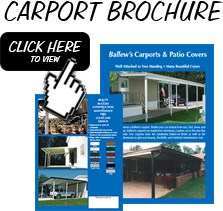 Ballew's carports are made from aluminum, custom cut to the size that fits your needs. Our aluminum carports have the handsome baked-on finish as well as the strength of aluminum to give you beauty, durability, and minimal maintenance cost. 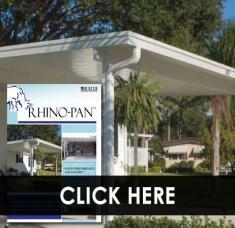 Rhino-Pan is a 3 riser panel thats designed for added strength, higher performance, and spans 25% farther than tradition patio covers. Its superior strength allows homeowners to construct covers without the addition of mid-span support beams. Galvalume is a patented coating process that is designed to protect the high-performance alloy with corrosion inhibitors used to manufacture the Rhino-Pan.